Just a quick post today to because I know people are going to have questions about this. Ok, if you see a few goats in Muskoseepi park over the next while don't be surprised; they are on the city payroll. Parks staff are running a test project to see how effective the goats are at controlling certain kinds of noxious weeks in the park. If it works this will give staff a way to control the weeds without having to resort to harsh chemicals. It's a part of what we call integrated pest management. The City of Grande Prairie is testing a green approach to controlling the spread of noxious weeds in the Bear Creek Corridor, starting today. Rocky Ridge Vegetation Control was contracted to work in that area of the community using foraging goats. “The City wants to determine if foraging goats could be a suitable control method in situations where access and environmental regulations make traditional controls difficult,” says Jim Donnelly, Integrated Pest Management Co-ordinator. The goats will eat noxious weeds such as Tansy, Toadflax and Thistle flowers. The Weed Control Act directs the City to control noxious weeds. 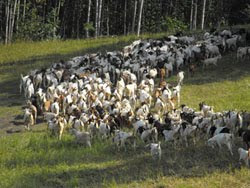 The goats have been used to reduce vegetation at the Nitehawk Ski Hill. Back in the middle of July I posted a note about the new transit routes that are coming to the city. Three of the new routes will launch in September and, for a week starting September 8th, any trip that starts on on of the new routes will be free! • Express Service from Towne Centre Mall to Prairie Mall every hour & continues on to Gateway, Westgate and Centre West Phase I. As of this morning (Monday August 24th) the city's transit department webpage hasn't been updated but I'll remind staff about that tomorrow at Public Works. Hopefully they'll be able to update that before the new routes launch. 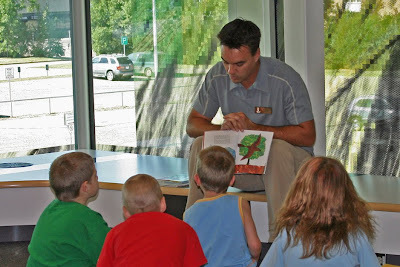 The Grande Prairie Public Library is holding it's grand opening tomorrow and there is a great line up of free family activities. You might remember that back in June we hosted a grand opening in conjunction with the Luitenant Governor's Arts Awards - that was actually for the whole Montrose Cultural Centre. Day of the Honey Bee? Quick note; I have Environment Committee at 3pm. It's a pretty light agenda only 3 items... a delegation from the Canadian Home Builders to talk about their "Build Green Initiative", discussion about a planning session for the committee and a report on the idea of declaring May 29th 2010 as "The Day of The Honey Bee" in Grande Prairie. This comes from a letter we received from a gentleman in Saskatoon who is campaigning to have all municipalities mark the same day. It may sound strange but there good reason to recognize the lowly honey bee. Scientists have noticed a phenomon called Colony Collapse Disorder that they fear could lead to the extinction of honey bees which would have a big impact on our food supply! Check out the Wikipedia article here. You can see the full text of the letter here on the website of a municipal politician from Guelph. So what do you think - should we mark the Day of the Honey Bee? While posting my note about Calgary Alderman Diane Colley-Urquhart's blog and I noticed another muniblog that I found a while ago. Anyhow, in my continuing search for local government politicians on the web I'll be adding his blog to the Worthwhile Blogs section on the right side of the page. Check out Ty's blog to see what's happening in municipal politics in Medicine Hat. Following along with some Alberta municipal mentions on Twitter I found the blog site of Calgary Alderman Diane Colley-Urquhart. Calgary is split up into wards and Diane represents the Glenmore area. It looks like Diane has only recently started blogging, with 2 posts in July and 2 in August. So, in my continuing search for local government politicians on the web I'll be adding her blog to the Worthwhile Blogs section on the right side of the page. Check out Diane's blog to see what's happening in municipal politics from down south, in Calgary Glenmore. 92 Street is handling a lot more traffic these days. Located on the east side of the city it's the major north-south road that leads from the Countryside South area back up to the new TD Bank and Starbucks on 100th Ave.
As the area had developed with new subdivisions more and more of the road has been improved and upgraded from the gravel state it used to be only a few years ago. There's still a fair chunk left to be done but it's getting there. If I remember correctly the part mentioned below was at a cost of about $3m and includes a much better culvert system for the crossing over the Woody Creek. You can click on the coloured lines in the map below to see what each chunk is. Improvements to 92 Street from 88 Avenue continuing to south of Park Road will begin this month. Upgrades include paving and widening of the roadway and trail, located to the east of the street, improved drainage, and the installation of a new culvert. During construction, motorists should expect some single lane closures and possible delays. “We ask that drivers consider alternative routes to access 92 Street, and thank them for their patience during this roadway improvement” says Project Technologist Richard Sali. ** Due to a culvert installation, 92 Street from Park Road south to the City’s Marshalling yard, will be closed from 7:00 a.m. August 19 to 7:00 p.m. August 21.